Ringworm isn’t quite what it sounds like in regards to guinea pigs—it’s not a parasitic worm, but a fungal infection. The infection is fairly common in guinea pigs, so learn more about the symptoms and treatment from a Waterloo veterinarian below. Ringworm in guinea pigs is caused by a particular family of fungus. It’s easily communicable between pigs—most animals are infected through contact with other infected guineas or by touching contaminated bedding or cage objects. What’s more, the infection is even transmittable to humans, so handling an infected pig should be done with care. The major symptom associated with ringworm in guinea pigs is bald patches. These usually begin around the head, and may have red, flaky patches in them. The bald patches are first seen on the nose, ears, and around the eyes, but can spread to other parts of the body if left untreated. Contact your veterinary professional as soon as you see these symptoms, or if you notice your pig scratching excessively. Your veterinarian will likely diagnose ringworm in your pig through a simple physical examination. A course of antifungal medications will be prescribed to rid your pig’s body of the infecting fungus. The use of these medicines might last for up to six weeks or more, depending on the severity of your pet’s infection. Bald patches with crusty, flaky surfaces are often treated with topical ointments that you spread on your pig’s body. Ask your Waterloo vet about the proper handling of these medicines, as well as a demonstration for application. In some cases, dietary supplements might even be prescribed to help your pig heal. 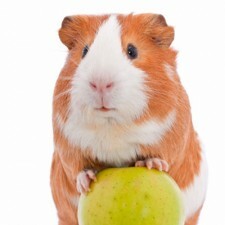 While you’re handling your infected guinea pig, wear disposable gloves at all times, and wash your hands with soap and water after each handling episode. Keep other animals and human family members away from your infected pig until he’s healed up. Do your part to minimize the risk of ringworm infection in your pig by keeping his cage clean and sanitized at all times. Weekly decontaminations and thorough cleaning of all cage materials can help cut back on the chance of infection.